– for all prayers except in Fajr prayer. – During the last rakaat of each prayer. Volume 001, Book 012, Hadith Number 790. When the Messenger of Allaah (peace and blessings of Allaah be upon him) sat during the prayer, he would place his left foot between his thigh and calf, and tuck his right foot underneath him, and place his left hand on his left knee, and place his right hand on his right thigh, and point with his finger. 1. In tashahud awal, one must prop up the right foot, bend the left foot while sitting on the left foot. 2. In tashahud akhir, one must also prop their right foot, but push the left foot between his thigh and calf while placing the left upper thigh and buttocks on the floor. The left palm covers the left knee, leaning heavily on it. This is called Mutawarrikan. 3. Left hand must be placed on left knee while right hand on the right thigh with finger pointing forward. For the last tashahud, one repeats what was read as the first tashahud and continue with the greetings of Prophet Muhammad sallahu alaihi wasalam and his family and also Prophet Ibrahim alaihi salam. In the tashahud this is what we are doing, in the first part we are glorifying Allah and in the second part we are sending salah to Prophet Muhammad allahu alaihi wasalam. This is to prepare you to make du’a before you give salam and ending the prayer. We will be using the fatwa in ISLAMQA concerning the matter Insya Allah. Every time you make du’aa’ you should point your finger, indicating the greatness of the One to Whom you are making du’aa’. In a two rakaah prayer (Fajr), the sitting of the final rakaah is Muftarishan i.e. as the sitting of tashahud awal. As other acts of solah, one should remain calm and not be hasty. 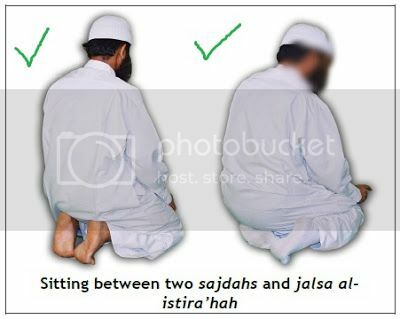 With regard to the way one should sit between sujoods, two ways of doing this have been narrated from the Prophet (peace and blessings of Allaah be upon him). Keeping the right foot upright and sitting on the left foot, as was described in the saheeh hadeeth which describes how he sat between two sujoods: “He kept his right foot upright,” and “he pointed its toes towards the qiblah.” This is the most well known way, and it is the way he sat most of the time. This way of sitting is called MUFTARISHAN. Prophet Muhammad sallallahu alaihi wasalam would be relaxed until his bone returned to its proper position when he sits in between the sajdahs. He ordered those who prayed badly to do likewise. Prophet Muhamamd sallalahu alaihi wasalam would lenghthen his sitting until it was almost as long as his sajdah (Bukhaari & Muslim)., and sometimes, he would remain in his position until one would think: He has forgotten. He (sallallahu alaihi wasalam) gracefully fell in prostration. The Muslims surrounding him followed in suit. Remarkably, it is what happened next that was the most amazing: the non-believers around them fell in prostration. Subhan Allah. They were so moved by the beautiful words of the Quran that they fell into sajdah irresistibly. Sajdah. The most humble of positions the creation can be in before their Rabb. As we fall into the lowest of positions, where our face (the most honoured part of us) is lower than our bottom feet, twice in each rakaah, we give praise to the Most High, Allah. Ibn Al-Qayyim described the sujood as the secret of prayer, the greatest pillar, and the seal of the rukoo’. He said all the other actions we did before it were just preludes. We should step back and reflect: what do we feel when we go into sujood? Some of us simply do it because it is a part of prayer; others because it is where we can make du`a’ (supplication). But how many of us feel the humility of the soul, as we put our faces on the ground, in glorification of God? Muhammad (SAW) is the Messenger of Allâh, And those who are with him are severe against disbelievers, and merciful among themselves. You see them bowing and falling down prostrate (in prayer), seeking Bounty from Allâh and (His) Good Pleasure. The mark of them (i.e. of their Faith) is on their faces (foreheads) from the traces of prostration (during prayers). Most people assume that the “mark” refers to the physical mark on one’s forehead that sometimes appears when one prostrates much. However, commenting on this verse, Mujahid stated that the “marks” refer to the marks of humility that come from khushoo’ (devotion), and this is just in the dunya (world). In the Hereafter, Al-Jalalayn described it as a light and radiance by which these people will be recognized. Prostration is also the most despised of positions to Iblis – it is the very position he refused to fall into at the command of Allah before Adam. Prostration is also the greatest time to supplicate to Allah. Ya Rabb make us among those who prostrate to You alone. Hands first before knees or knees before hand? There is a difference of opinion even among them scholars. So which one do we follow? Whichever scholar that trust most Insya Allah. Allah knows best. ii. and so is your nose. v. be sure that our feet is close together and on the ground and not lifted above the ground. Again we need to check our arms. Is it on the floor? Just like a dog sitting down on all fours. Prophet Muhammad salllahu alaihi wasalam caution us not to do our prayer like the animal namely bird that pecks too fast, camel sitting down and now a dog stretching his forearms. In prostration, he placed both his hands on the ground with his forearms away from his body and his toes were facing the qiblah. There are a few invocation that Prophet sallahu alaihi wasalam recited during his prostration. We are only used to the common one. I think it is time that we learn a new invocation Insya Allah. Abu Huraira reported: The Messenger of Allah (may peace be upon him) said: The nearest a servant comes to his Lord is when he is prostrating himself, so make supplication (in this state). We are in the state most near to Allah when we make sujood. We should try to make supplication to Allah at this time, make sujood properly as taught by prophet sallallahu alaihi wasalam.